Tag Archives for " +1 button "
The truth is nobody really had much idea what the payoff for clicking that button was. There’s always the implication that pages with lots of +1s would naturally get a little bump in the Google algorithm, but certainly no word from Google on that. Today the +1 Button’s payoff is very clear. 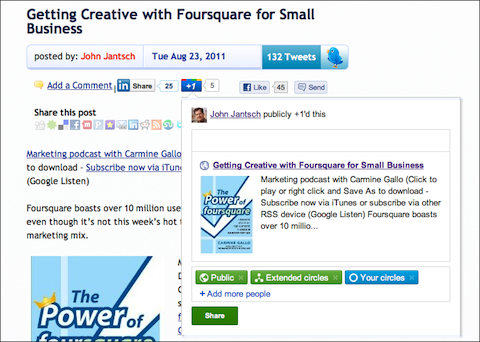 Google has added a feature that in my mind mandates the addition of the +1 button to your pages and blog posts. Now, when someone finds some content that they want to +1 they will have to option to share the content directly to Google Plus and whatever circles they choose just by hovering over the +1 button. This makes the +1 button on par with the Facebook Send and LinkedIn InShare buttons in terms of potential exposure the +1d content can receive. I wrote about how add the +1 button to your site here. You can also use a +1 WordPress Plugin to make this happen on a WordPress blog.